5. 7000 RPM’s make short work of long grass. 4. Your back and knees deserve a break. 3. No lawn mowing job is complete until the trimming is done. 2. Lots of handy attachments can make these machines as handy as a Swiss pocket knife. 1. Nylon cutting line never needs sharpening. Pros: There is no faster way to trim a lawn, gasoline and electric models fill different needs. Cons: Cutting heads need to be refilled with line in a regular basis, some automatic or semi automatic line advancing heads are finicky. 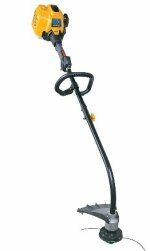 Features available: Straight shaft, curved shaft, two or 4 cycle engines, cord or battery powered electric, attachments for edging, blowing, and pruning. The person who invented the power string trimmer deserves the Nobel Peace prize for lawn maintenance. In the old days, the freshly cut lawn had to be trimmed by hand. There were a variety of tools used to accomplish this task, from hand shears, to the ‘ultra modern’ battery powered clippers. All of these older tools had one thing in common - you were on your knees, giving your lawn the professional look the hard way - one 12 inch section at a time. If the lawn was large, your hand would slowly cramp into a solid mass of screaming tendons and muscle, only to be outdone by the throbbing pain in your knees and back. No wonder mowing the lawn was such a chore! Then came the 1970’s. Small, lightweight 2 cycle engines were attached to a shaft with a cutting head on the other end. The head speed of thousands of RPM’s combined with a cutting width of 16 inches made the long grass on the lawn edges fly. The string trimmer allowed for standing while the grass was cut - and allowed the job to get done in a fraction of the time. The string trimmer caught on in America like wild fire. Homeowners and pros alike embraced the new technology. New brands popped up like dandelions in a new lawn, and the prices dropped as these time savers were sold in discount stores. The latest models can be gasoline powered, or electric. The electric machines can get their power from a battery, or a traditional extension cord. No matter how you cut it, these sweet machines are on the scene to stay. The very first string trimmers developed were powered by a 2 cycle engine. The advantages of these engines are their light weight and fast engine speeds - easily exceeding 7000 RPM’s. The secret to the weight and speed of the 2 cycle engines lies in their simplicity - there are only 3 moving parts ( piston, rod, and crankshaft). The downfall of the 2 cycle engine is the emissions problem. These engines are notoriously dirty, emitting more pollutants than the average car engine! Since California has mandated strict emission standards, the industry has had to respond with cleaner burning engines. One way of coping with the cleaner air standards was to use a 4 cycle engine to power the string trimmers. Another approach was to use a ‘hybrid’ design, which features a reservoir of oil in the crankcase for lubrication like a 4 cycle engine, while maintaining the simplicity of the 2 cycle engine with its 3 moving parts. The trimmer shaft allows for the transfer of engine power to the cutting head. The spinning shaft is protected by an aluminum sleeve - this also prevents abrasive dirt from entering the system. Most modern trimmers contain a clutch, which prevents the cutting head from turing at low engine speeds. The clutch automatically engages as the engine speeds increase. The straight shaft trimmers contain a solid, flame hardened shaft supported by ball bearings. At the cutting head end, a gearbox transfers the power to the cutting head. A solid shaft is the very best design, and is featured on most professional grade machines. Curved shaft trimmers feature a flexible shaft that resembles a very heavy duty version of brake cable on a bicycle. Since the shaft is flexible, a gear box on the cutting head of the trimmer is avoided. The cable transferring the engine power to the cutting head has a little ‘give’, which results in a loss of energy. Most homeowner grade string trimmers are of the flex shaft design. More versions of the cutting head have been developed over the years than can easily be counted. Most of the modern trimmers will advance more cutting line from the storage spool in the cutting head by one of 2 methods - either automatically, or by ‘bumping’ the head against the ground as the engine is running full speed. Both designs have their advantages. In either case, the protective shroud that surrounds the cutting head has a sharp edge built-in, that will cut the excess line automatically as it is advanced from the spool. The standard handle for most string trimmers is the closed loop design. This allows for easy maneuvering of the cutting head. Proper placement of the handle acts as a fulcrum, balancing the weight of the engine against the weight of the shaft and cutting head. The larger straight shaft trimmers can be equipped with a steel cutting blade, for clearing brush and small trees. This type of application demands a ‘bicycle handle’ style handle, which separates the hands by several feet, allowing for better blade control. Click on the trimmer brand that interests you to learn more. Take me back Home from String Trimmers.